All nominees are recognized at an event sponsored by the Office of the Vice President for Student Affairs during National Student Employee Appreciation Week in April. The recipient of the President’s Student Employee of the Year Award also is recognized at the President’s Staff Awards event. To help ensure the continuation of UT Austin's recognition and development programs for student employees, including the Student Employee Excellence Development (SEED) Program, please consider donating to the Student Employee Recognition Program fund. Donations in any amount are welcome! Congratulations to senior Katie Strain, recipient of The University of Texas at Austin's 2019 President's Student Employee of the Year Award! 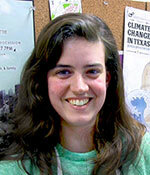 She is an Environmental & Biological Sciences Major in The College of Natural Sciences. 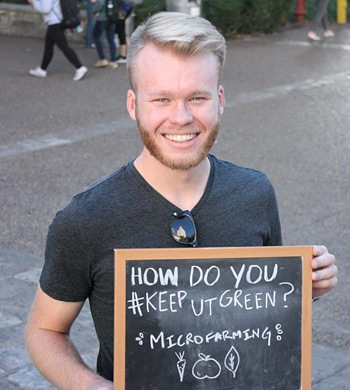 Katie manages the UT Farm Stand for University Housing and Dining's Sustainability team. Katie and her fellow Student Employee of the Year finalists will be honored at an on-campus luncheon on April 15, 2019. Watch us surprise Katie to announce she was awarded the 2019 President's Student Employee of the Year Award on Facebook Live! We are pleased to recognize James Collins (pictured on left) as the recipient of the 2017-2018 President’s Student Employee of the Year Award. James is being recognized for his work as a Campus Environmental Center Ambassador in the Office of Sustainability. 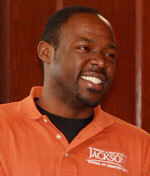 James also works as a Texas Water Research Network (TWRN) Student Assistant in the Environmental Science Institute. Please take a moment to view the video about James produced by FAS Communications. Raul Pineda (pictured on left) was the recipient of the 2016-2017 President's Student Employee of the Year Award. 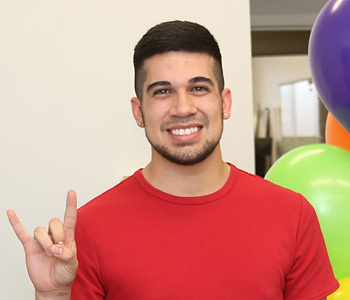 Raul worked as a Senior Student Associate in the Office of Strategy and Policy, where he served as the OnRamps Innovation Fellow for Instructional Design. Please take a moment to view the video about Raul produced by the Division of Student Affairs. Hana’A Said (pictured on left), a Peer Mentor with the Texas Interdisciplinary Plan (TIP) Scholars Program in the College of Natural Sciences, was selected as the recipient of the 2015-2016 President’s Student Employee of the Year Award. 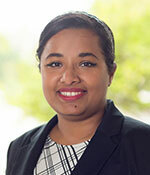 Hana’A also worked as a Resident Assistant for the Division of Housing and Food Service. Please take a moment to view the video about Hana’A produced by the Division of Student Affairs. Coleman A. Tharpe (pictured on left) was selected as the University of Texas at Austin’s 2014-2015 Student Employee of the Year. 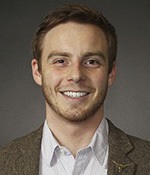 Coleman was honored for his work as a Senior Student Associate for the Webber Energy Group in the Department of Mechanical Engineering, Cockrell School of Engineering. In a first for UT Austin, Coleman also was selected as the recipient of both the 2015 National Student Employee of the Year Award, presented by the National Student Employment Association, and the 2015 SASEA Student Employee of the Year Award, presented by the Southern Association of Student Employment Administrators. Please take a moment to view the video about Coleman produced by the Division of Student Affairs. Lauren A. Fedele (pictured on left), Student Associate in Facilities Services and Tailgate Recycling Coordinator for the Campus Environmental Center, was selected as The University of Texas at Austin’s 2013-2014 Student Employee of the Year. 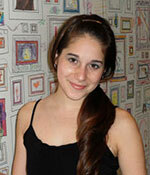 Please take a moment to view the video about Lauren produced by the Division of Student Affairs. 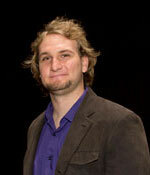 Kevin J. Luecke (pictured on left), Undergraduate Research Assistant in the College of Natural Sciences, Department of Astronomy - McDonald Observatory, was selected as The University of Texas at Austin’s 2012-2013 Student Employee of the Year. Please take a moment to view the video about Kevin produced by the Division of Student Affairs. Bianca Wugofski (pictured on left), Student Associate at Texas Performing Arts, was selected as The University of Texas at Austin’s 2011-2012 Student Employee of the Year. On April 4, 2011, Brandon Okafor (pictured on left), Student Associate in the Jackson School of Geosciences, was presented The University of Texas at Austin’s first Student Employee of the Year Award.